Should I Let My Child Work With a Personal Trainer? I’ve received this question a few times and here are some tips and advice I like to provide parents when they come to me with this question. First and foremost your child should want to participate in the training sessions or else it won’t benefit anyone. Having your child assist in creating goals is a good way to get them to give 100% because they are working towards goals they set which means those are the things that are important to him or her. Next if your child wants to participate in personal training to improve their athletic performance there are a few things to consider. For instance what is the experience level of the trainer and what certifications do they hold. Make sure the trainer has experience working with children and has worked with athletes that play the same or similar sports that your child is looking to train for. Next look into what certifications the trainer has. Not all certifications are created equally and some require more rigorous requirements to obtain, such as greater levels of education and more hands on training. At Prue Physical Therapy & Sports Performance we prefer certified strength and conditioning coaches (CSCS) from the National Strength and Conditioning Association (NSCA) because this particular certification is known as the industry standard, and you won’t find a division 1 collegiate athletic program that doesn’t require an individual to obtain this certification in order to work with their athletes. But is it safe for my child to work with a personal trainer? Another question I get asked a lot is: is it safe for my son or daughter to start lifting weights? When asked this question I like to clarify a few things with the family. First, lifting weights can be a very safe form of exercise for a child, but there is more to it than that. Weight lifting is just one form of resistance training, and resistance training can be very safe and beneficial to a child or teen if done correctly. Other forms of resistance training include body weight exercises, resistance tubing, and weight machines. Generally I like starting with body weight exercises for younger children and work up towards resistance tubing and free weights for older and more physically mature children. I don’t love using weight machines with youth athletes because these machines are generally created for adults who have longer limbs, so these machines can put added stress on a child’s joints. It’s also harder to mimic the athletic types of movements that we are trying to recreate and train when using a machine vs other types of resistance training. However there are some machines now that are being created for children which can be beneficial and have their place in a training program. It’s also important to note that a well-rounded program may include a lot more than resistance training depending on your child’s goals. 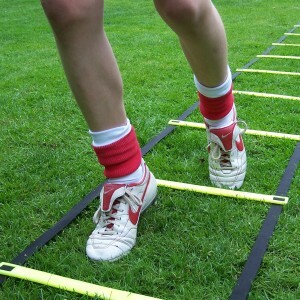 If they are looking to improve speed and power, a program may include work with an speed ladder, sprint training, agility drills, box jumps and medicine ball throws. What makes these activities any different than things children do almost on a daily basis? Almost nothing, children run, jump and throw things every day, and if they are playing a sport these activities are necessary in most cases in order to compete. The biggest difference between playing and training is that training is planned, programmed and organized. A strength and conditioning coach will ensure form is correct and to make sure the program is designed appropriately so the selection and volume of exercises matches the child’s goals, age and training level. So in general a strength and conditioning program or personal training program can be safe and beneficial to a youth athlete or any child who is looking to improve their physical health. Just make sure you follow our tips and your child should be safe and they will probably have a lot of fun. If you or your child has worked with a personal trainer feel free to share your experiences with us. What kind of gains did they achieve? Was it what you were expecting?